In your search for a new pair of headphones you may have come across some that have active noise cancelling (ANC). But what is it and how does it work? So in your search for a new pair of headphones you may have come across some that have active noise cancelling (ANC). Blocking outside noise when listening to music can be really helpful, especially in noisy environments. Plenty of companies have tried their hand at ANC headphones, and a few like Bose and Sony have become so good at it that it’s one of the main selling points for buying a pair of their headphones. But how does it work? Physics. Yay Science! To understand how ANC works, it’s important to first know the different aspects of sound. If you try to visualize sound, you probably picture it in the form of a wave like the one pictured above. Though this 2D illustration will definitely come in handy later, it isn’t entirely an accurate depiction of what sound actually is. At least not until you fully understand what it implies. This is where the physics kicks in. Sound as you hear it is really just the compression and decompression of the particles in the medium in which it flows through. Wow, I know that was boring just to type, but stay with me I promise it gets better. It may be a little easier to picture sound as a 3D ripple through (in our case) air particles. Those vibrating particles lead to very slight changes in air pressure. We call these changes in air pressure amplitude. Your ears can detect and decipher those changes in pressure as sound. If you graph the changes in pressure, or amplitude, over time you end up with the wave pictured above. The louder the sound, the higher the amplitude. So now that we know how to get a sine wave, let’s break it down. Now we can get into how headphones cancel outside noise. The answer is phase and anti-phase. What does that mean? Let’s go over it. The highest point of the wave is called the peak, and the lowest point is the trough. These are just characteristics of a wave, as any surfer probably knows. Now if you take two waves and place them on top of each other matching up the peaks and troughs, the two waves are said to be “in-phase” which results in an even larger wave. But what happens if you move one of the waves over slightly matching up the the trough of one with the peak of the other like in the picture above? Well then you’ve effectively cancelled your first wave. 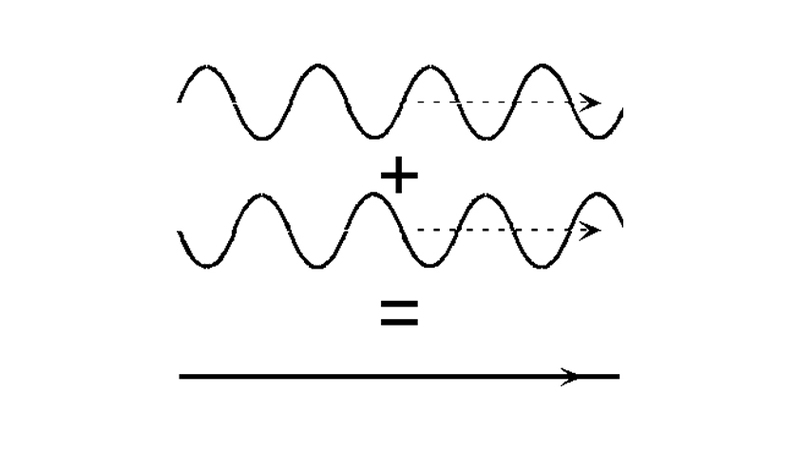 The two waves are then said to be “out of phase” and dissipate to zero. Think of it as trying to add one and subtract one. You’re just left with zero. This is the physics behind active noise canceling. But how is that used in your headphones? So how do headphones achieve this? By way of tiny microphones on the outside of your headphones. They listen to the ambient noise around you, which is processed as a sound wave. The headphones then create sound that is exactly opposite to that sound wave (the anti-phase) and cancel it out so that all you hear is the music coming from your headphones and not anything going on outside. Of course this is all theoretical. In practice, noise cancellation is hard to do and far from perfect. Consistent noises like the low hums of jet engines on airplanes are easier for headphones to recognize and cancel when compared to sudden, random sounds like people talking. While the physics remains the same, some companies are better at active noise cancelling than others. But now that you know how it works, you can pick the pair that’s right for you.